The Peruvian Andean communities, living in high windy plains and on steep mountain slopes, surrounded by snow-.‐capped peaks, are severely suffering from the consequences of climate change, In the region of Puno, the mostly rain-.‐fed community agriculture has to guarantee the food security of over a 1,100,000 people, while facing severe climatic events like extreme cold fronts, frost and hail tt and extended droughts. 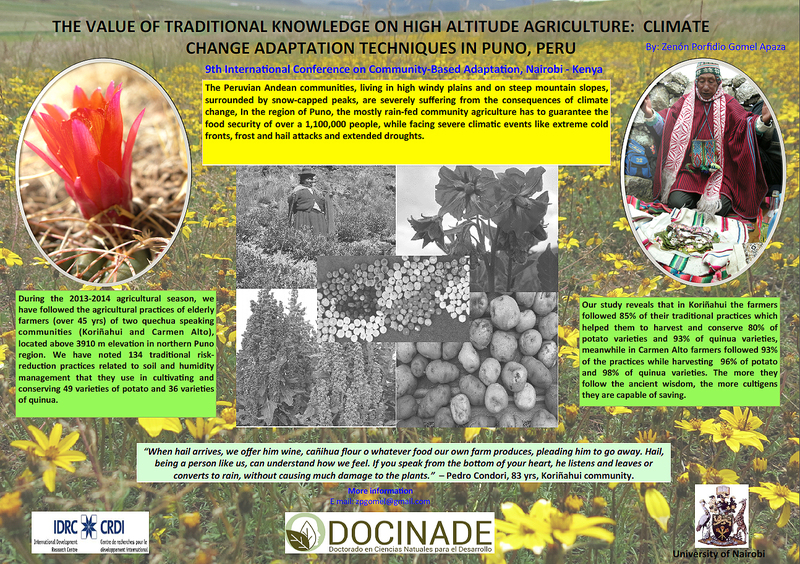 During the 2013-.‐2014 agricultural season, we have followed the agricultural practices of elderly farmers (over 45 yrs) of two quechua speaking communities (Korinahui and Carmen Alto), located above 3910m elevation in northern Puno region. We have noted 134 traditional risk-reduction practices related to soil and humidity management that they use in cultivating and conserving 49 varieties of potato and 36 varieties of quinua. Our study reveals that in Korinahui the farmers followed 85% of their traditional practices which helped them to harvest and conserve 80% of potato varieties and 93% of quinua varieties, meanwhile in Carmen Alto farmers followed 93% of the practices while harvesting 96% of potato and 98% of quinua varieties. The more they follow the ancient wisdom, the more cultigens they are capable of saving. The original poster was produced by Zenon Porfidio Gomel Apaza.